Defibrillation is a process in which an electrical device called a defibrillator sends an electric shock to the heart to stop an arrhythmia resulting in the return of a productive heart rhythm. Defibrillation is performed to correct life-threatening arrhythmias of the heart including ventricular fibrillation and cardiac arrest. In cardiac emergencies it should be performed immediately after identifying that the patient is experiencing an arrhythmia, indicated by lack of pulse and unresponsiveness. If an electrocardiogram is available, the arrhythmia can be displayed visually for additional confirmation. For medical treatment by a physician, in non-life threatening situations, atrial defibrillation can be used to treat atrial fibrillation or flutter. Defibrillation should not be performed on a patient who has a pulse or is alert, as this could cause a lethal heart rhythm disturbance or cardiac arrest. The paddles used in the procedure should not be placed on a woman's breasts or over an internal pacemaker. Photograph by Adam Hart-Davis. Science Source/Photo Researchers. Reproduced by permission. Cardiac arrhythmias that prevent the heart from pumping blood to the body can cause irreversible damage to the major organs including the brain and heart. These arrhythmias include ventricular tachycardia, fibrillation, and cardiac arrest. About 10% of the ability to restart the heart is lost with every minute that the heart fibrillates. Death can occur in minutes unless a productive heart rhythm, able to generate a pulse, is restored through defibrillation. Because immediate defibrillation is crucial to the patient's survival, the American Heart Association has called for the integration of defibrillation into an effective emergency cardiac care system. The system should include early access, early cardiopulmonary resuscitation , early defibrillation, and early advanced cardiac care. Defibrillators deliver a brief electric shock to the heart, which enables the heart's natural pacemaker to regain control and establish a productive heart rhythm. 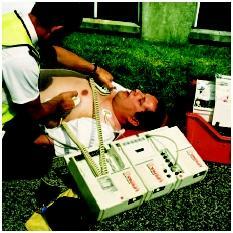 The defibrillator is an electronic device that includes defibrillator paddles and electrocardiogram monitoring. During external defibrillation, the paddles are placed on the patient's chest with a conducting gel ensuring good contact with the skin. When the heart can be visualized directly, during thoracic surgery , sterile internal paddles are applied directly to the heart. Direct contact with the patient is discontinued by all caregivers. If additional defibrillation is required the paddles should be repositioned exactly to increase the likelihood of further shocks being effective in stopping the arrhythmia. The patient's pulse and/or electrocardiogram are continually monitored when defibrillation is not in progress. Medications to treat possible causes of the abnormal heart rhythm may be administered. Defibrillation continues until the patient's condition stabilizes or the procedure is ordered to be discontinued. Once a patient is found in cardiac distress, without a pulse and non-responsive, and help is summoned, cardiopulmonary resuscitation (CPR) is begun and continued until the caregivers arrive and are able to provide defibrillation. Electrocardiogram leads are attached to the patient chest. Gel or paste is applied to the defibrillator paddles, or two gel pads are placed on the patient's chest. The caregivers verify lack of a pulse while visualizing the electrocardiogram, assure contact with the patient is discontinued, and deliver the electrical charge. Atrial defibrillation is a treatment option that will be ordered for treatment of atrial fibrillation or flutter. The electrocardiogram will be monitored throughout the procedure. The paddles are placed on the patients chest with conducting gel to ensure good contact between the paddles and skin. If the heart can be visualized directly during thoracic surgery, the paddles will be applied directly to the heart. The defibrillator is programmed to recognize distinct components of the electrocardiogram and will only fire the electrical shock at the correct time. Again, all direct contact with the patient is discontinued prior to defibrillation. After defibrillation, the patient's cardiac status, breathing, and vital signs are monitored with a cardiac monitor . Additional tests to measure cardiac damage will be performed, which can include a 12 lead electrocardiogram, a chest x-ray, and cardiac catheterization . Treatment options will be determined from the outcome of these procedures. The patient's skin is cleansed to remove gel and, if necessary, electrical burns are treated. Defibrillation performed to treat life-threatening ventricular arrhythmias is most likely to be effective within the first five minutes, preventing brain injury and death by returning the heart to a productive rhythm able to produce a pulse. Patients will be transferred to a hospital critical care unit for additional monitoring, diagnosis, and treatment of the arrhythmia. Intubation may be required for respiratory distress. Medications to improve cardiac function and prevent additional arrhythmias, are frequently administered. Some cardiac function may be lost due to the actual defibrillation, but is also associated with the underlying disease. Atrial defibrillation is successful at restoring cardiac output, alleviating shortness of breath, and decreasing the occurrence of clot formation in the atria. Giuliani, E. R., et al., eds. "Arrhythmias." In Mayo Clinic Practice of Cardiology. 3rd ed. St. Louis: Mosby, 1996. Bur, Andreas, et al. "Effects of Bystander First Aid, Defibrillation and Advanced Life Support on Neurological Outcome and Hospital Costs in Patients after Ventricular Fibrillation Cardiac Arrest." Intensive Care Medicine 27 (2001): 1474–1480. Herlitz, J., et al. "Characteristics and Outcome Among Patients Suffering In-hospital Cardiac Arrest in Monitored and Non-monitored Areas." Resuscitation 48 (2001): 125–135. Matarese, Leonard. "Police and AEDS: A Chance to Save Thousands of Lives Each Year." Public Management 79 (June 1997): 4. "Medical Breakthroughs That Could Save Your Life." Body Bulletin (February 1998): 1. "Upping the Odds of Survival." Hospitals and Health Networks 71 (June 5, 1997): 13. This is the information I was reading you over the phone. Generally speaking, how long do you have from the onset of a heart problem to use a defibrillato? If it takes-- say 15 minutes to get the machine to the patient because of distance and circumstances is it a waste of time to have one? @ nello teer ... even if it takes 15 mins its not a problem as u can do the CPR on the patient. The pads has to be placed in the apex & sternum of the patient. In case if the position is not correct, will the defibrillation be effective in a mono as well as biphasic machine? If the positioning is wrong what will happen. After defibrillation has been performed, how soon can another shock be administered? The doctors used the defibrillator on me after my heart rate went up to 190 BPM during my brain surgery. if my heart had been bruised from the defibrillator? I was shocked three times in the OR. Defib in for year just noticed bad bruising ?? Bruise over insert sight ?